Last year, we shared the release of a great developer experience through Ansible in Azure Cloud Shell, and the Ansible extension for Visual Studio Code. Today we’re excited to be expanding our support of Ansible on Azure with a fully configured Azure Marketplace Ansible solution. As you know from interacting with Microsoft Azure services, we delivered a suite of Ansible cloud modules that help you automate provisioning and orchestrate your infrastructure on Azure. Using Ansible cloud modules for Azure requires authenticating with the Azure API. This Ansible solution enables teams to use Ansible with managed identities for Azure resources, formerly known as Managed Service Identity (MSI). This means you can use the identity to authenticate to any service that supports Azure Active Directory authentication, without any credentials in your code or environment variables. Furthermore, this solution template also permits you to select the Ansible releases later than version 2.5.0, such as 2.7.5, according to your needs. By default, the latest release version is used. It also enables Azure CLI. These features allow you to use a consistently hosted instance of Ansible for cloud configuration & management and production scenarios. 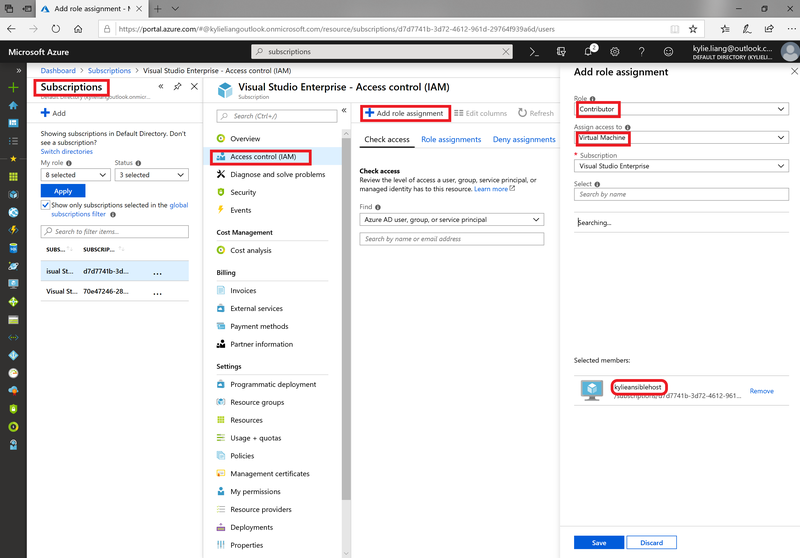 You can search Ansible in your Azure portal or go to Azure Marketplace and select Get it now to create a hosted instance of Ansible. You also can find a three minute QuickStart that provides a step-by-step walkthrough. It’s common to write Ansible playbooks in a local environment, but run them in a fully configured Ansible host. We added secure shell support for the Ansible extension to permit Ansible developers to copy Ansible playbooks or the whole workspace, and run them in the remote Ansible host. Now Ansible developers can use Ansible extension in Visual Studio Code, a free code editor which runs on macOS, Linux, and Windows operating systems to develop Ansible playbooks in any platform and run them in a fully configured Ansible host created by Ansible solution. You need to grant the virtual machine access to the subscription used to connect to the Ansible host from your local environment. We are excited about the improving developer experience we are creating for Ansible on Azure. Go ahead and try the Ansible solution. For more information visit the Ansible on Azure developer hub.